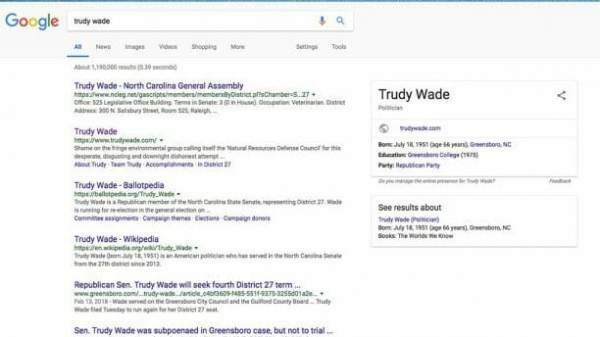 A Google search of Trudy Wade, a Republican state senator from North Carolina and an ardent supporter of President Trump displays an old photo in the “knowledge panel” of its search results with “BIGOT” written across it. After news of the skewed search engine results of the GOP senator began to circulate the web Friday evening, the image result was removed later in the day. A search of Wade now only provides brief background information and her website address. Wade represents North Carolina’s 27th district has held the office since 2013 and is currently up for re-election, facing off against Democrat Michael Garrett. This is the second “error” Google has made at the expense of a conservatives that has been discovered this week. Political strategist Eric Wilson noticed on Thursday that Google’s search engine results listed “Nazism” as the ideology of the California Republican Party. As Gateway Pundit reported, Google, which was the most frequent visitor to the Obama White House and altered its search engine to benefit Hillary Clinton’s presidential campaign, barely acknowledged memorial day. Previous Previous post: Federal Prosecutors Interview Comey, Suggest Possible Charges For MCabe, Five Years in Prison?